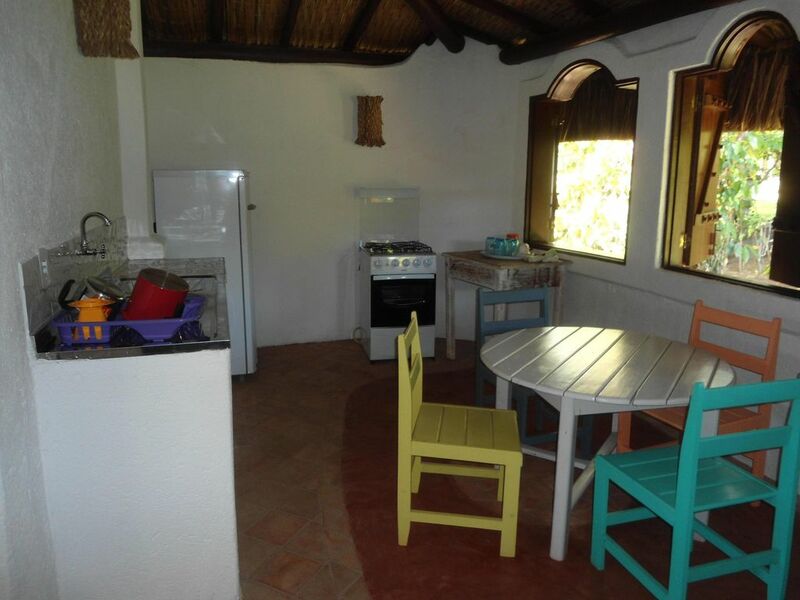 The 2 chalets have an area of ​​about 65 mq each and the 2 have the space divided into 1 bedroom with double bed, mosquito net, fan, equipped kitchen, living room and balcony with panoramic view of Pitinga Beach and accommodates the 2 floors 4 people (1 double bed + 1 sofa futon double bed), the chalet loft 3 people (1 double bed + 1 single). The two properties are inserted in a tropical garden of 1. 000 m2 with panoramic view and private access to Pitinga Beach. It is ideal for those who are looking for tranquillitade and nature. House: 2 suites upstairs, 1 sofa bed in the living room and possibility of double mattress in the living room fireplace. Cottage 1 floor: double bed in the bedroom and 2 single beds in the room Cottage 2 floors: a double bed in the room and a double bed on the mezzanine with terrace. The Alto da Pitinga Residence is located in the Palese Beach Falesia, where the natural reserve that extends to Trancoso (3 hours walk to Trancoso) begins. The 3km from the historical center of Arraial d'Ajuda, 4.5km from the water park, 3 km from Club Med and the Terravista Golf Course. The south lies the towns of Trancoso, Mirror, Caraiva and Corumbau, north Porto Seguro, Cabralia, Santo Andrè and Belmonte (excursion 1 day). The street Mucuge in the center of Arraial, known as one of the most charming streets of Brazil è full of small restaurants, bars and shops and propociona great moments of fun.